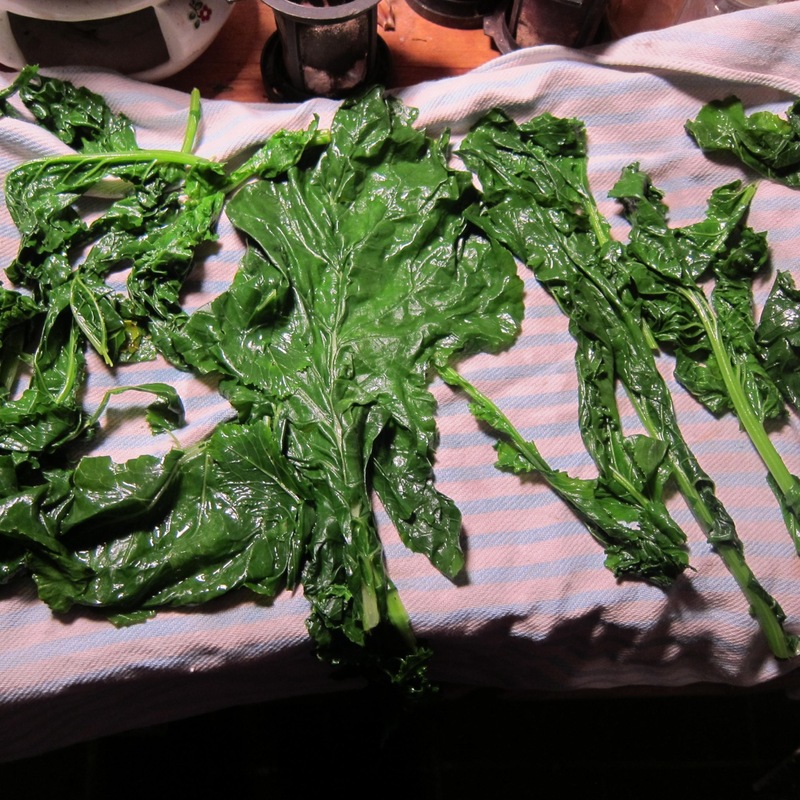 It turns out that while broccoli rabe is a member of the brassica family–which includes broccoli, cabbage, kale, kohlrabi, Brussels sprouts, cauliflower, turnips and more–it is not that closely related to broccoli at all. 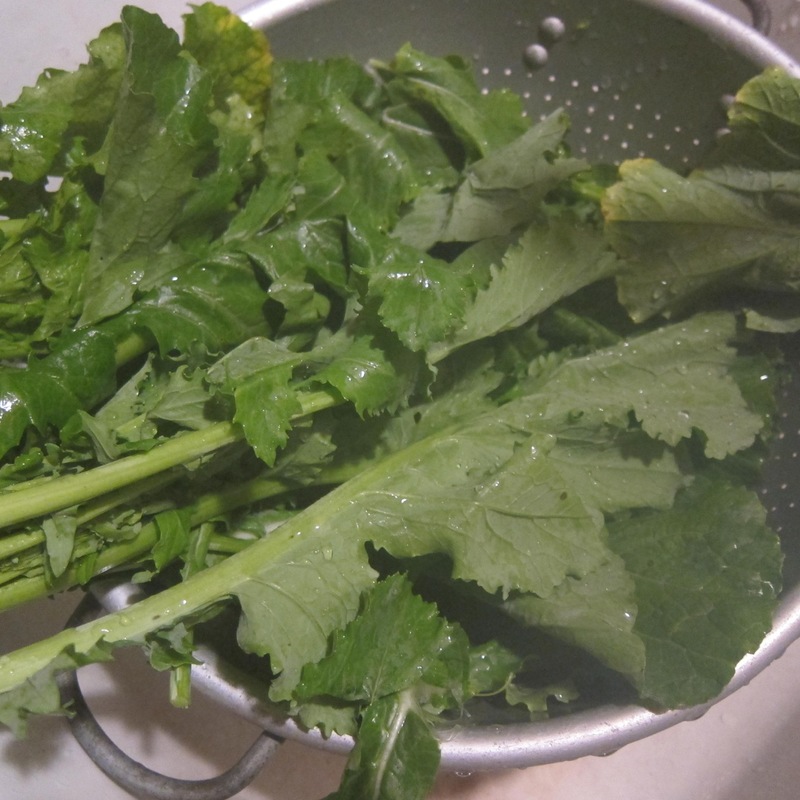 In fact, it’s more closely related to turnips, and one of its names in Italian translates to “turnip tops.” You may also see it referred to as rapini or broccoli raab. Some broccoli rabe may have tiny buds that resemble broccoli, but the broccoli rabe you’ll find at the Hampshire CSA is entirely leafy. 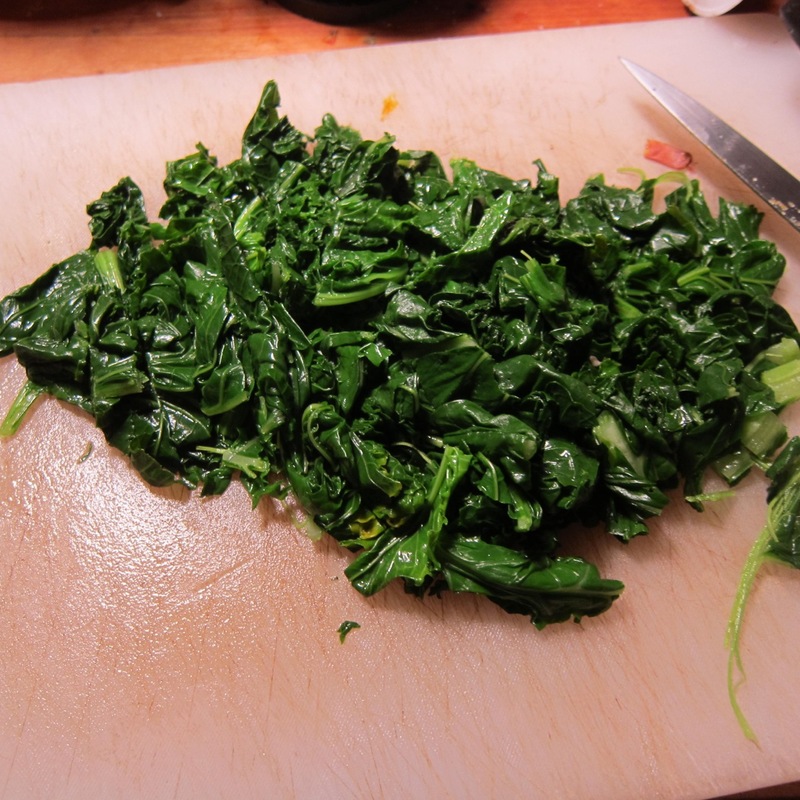 What I’ve learned, in this last week of broccoli rabe immersion, is that while it has a variety of names, there is consensus on the best way to cook it: sauteed in olive oil with lots of garlic and red pepper flakes. This was the guidance from Farmer Nancy and from Deborah Madison, two trustworthy sources for sure. Then I opened the Once Upon a Tart cookbook (a $2 find at the recent League of Women Voters book sale) to look at their white-bean spread sandwich with sauteed broccoli rabe and sun-dried tomatoes and read the little box of notes about broccoli rabe, and there it was again–saute, olive oil, garlic. I decided not to buck the tide. 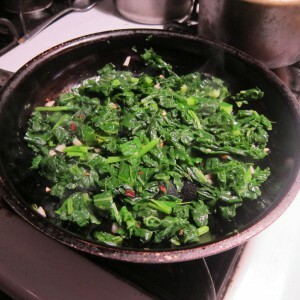 If everyone was telling me to saute the broccoli rabe in olive oil with garlic, I would. But then there was still the question of what to do with it then. Eat it plain was certainly an option, and Deb at Smitten Kitchen’s recipe for Pasta with Garlicky Broccoli Rabe was certainly intriguing. In the end, though, I decided to go with pizza. I was especially intrigued by the Broccoli Rabe, Potato and Rosemary Pizza on Food 52, which won their best pizza contest a few years back. Food 52 is a crowd-sourced site, and their voters haven’t steered me wrong yet. This is a multi-step recipe, as most pizza is. I’m not going to talk about the crust today–feel free to use your favorite crust, either store bought or homemade. I will mention, though, that there is a new post on pizza up at Smitten Kitchen that is worth taking a look at: Lazy Pizza Dough. I will note that I’ve used both of Deb’s previous pizza dough recipes to good effect, though I will probably try the new one as well: Simplest Pizza Dough and Wine and Honey Pizza Dough. 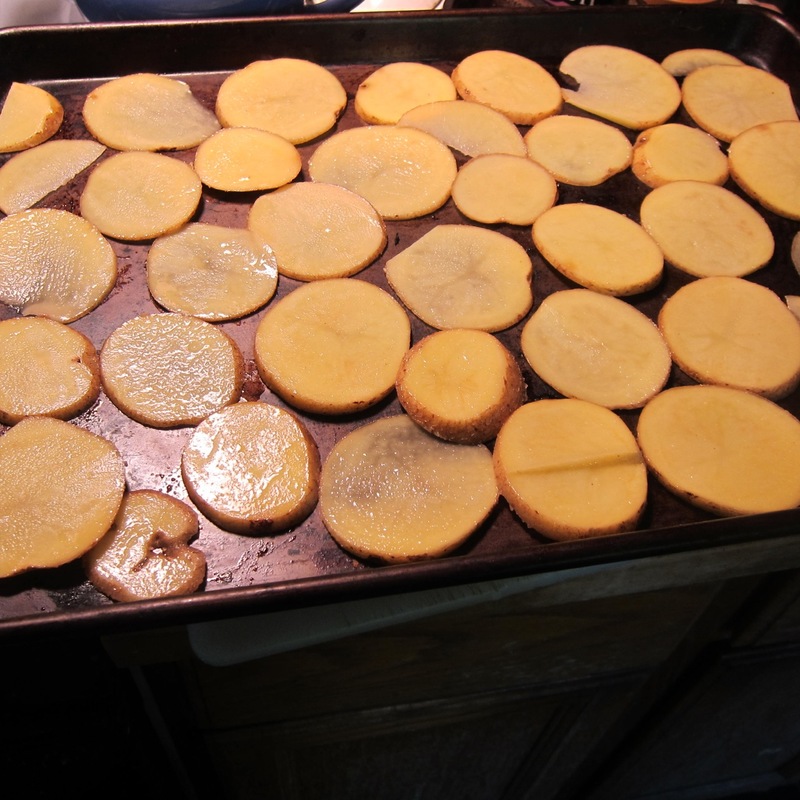 Dough aside, the main thing you need to do ahead of time is cook the potatoes. 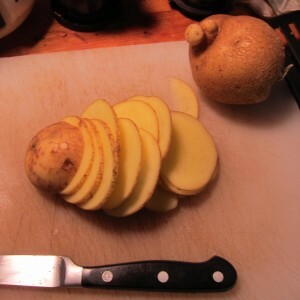 You slice them very thinly, toss them with some olive oil and salt and bake in a hot oven. 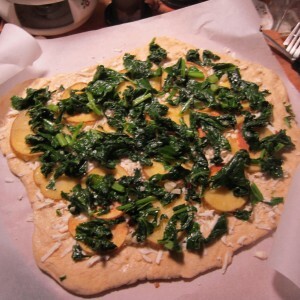 My main suggestion is to make extras because you will want to eat some of them as soon as they come out of the oven, and you want to make sure that you have enough for the pizza. 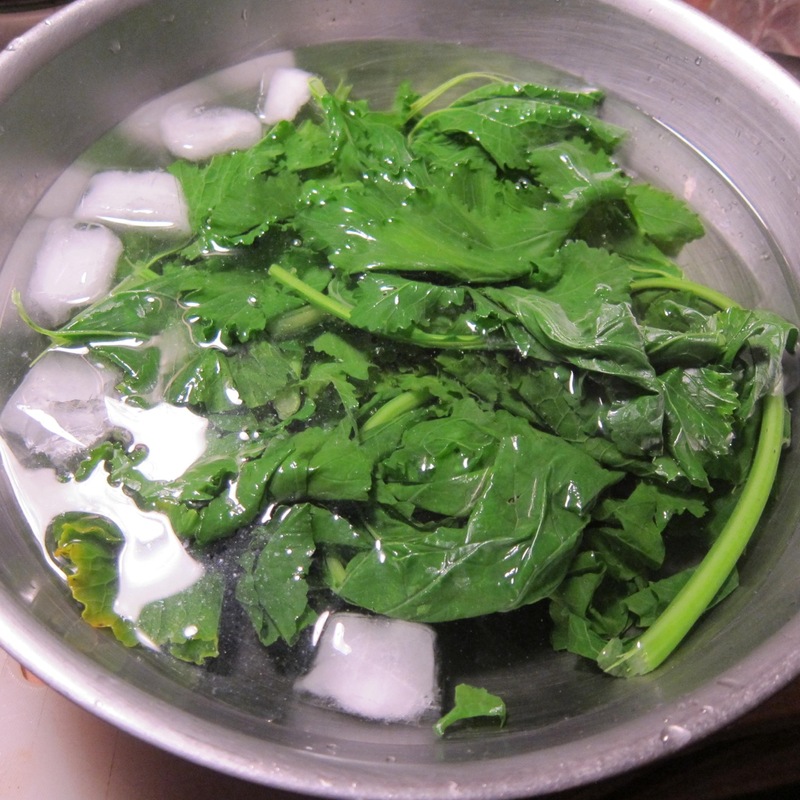 Meanwhile, you deal with the broccoli rabe. This recipe includes the step of blanching it first to take away some of the bitterness and then dunking it in ice water to keep the color. As with any other green, your large bunch shrinks considerably by the time it’s been cooked. Then, you saute it in olive oil with garlic and red pepper flakes. 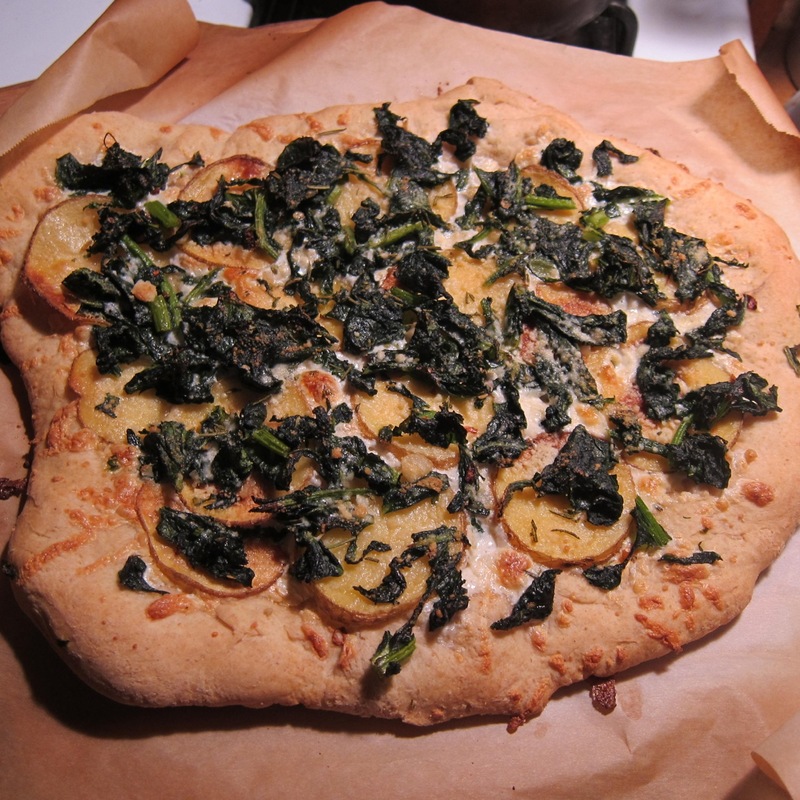 A word about the parchment paper beneath my pizza. If you’re going to make pizza with any regularity at all, I highly recommend getting a pizza stone. It really makes a difference in terms of the crust. A few years ago, I also got a pizza peel, the wooden paddle you use to get the pizza onto the stone. It is probably my lack of skill that is the cause of this, but I found that even with the nifty pizza peel, I couldn’t always get the pizza, usually laden with stuff on top, onto the stone in one piece. Sometimes it crumpled, sometimes it folded, and sometimes the toppings slid off. So I returned to what I’d been doing before I had the peel and put my pizza together on a piece of parchment paper. You can then easily slide the pizza either from a cookie sheet turned upside down or the peel onto the stone in the oven intact. The parchment doesn’t interfere with the crust, and it just makes everything much easier. The pizza that finally emerged from the oven was savory and delicious. 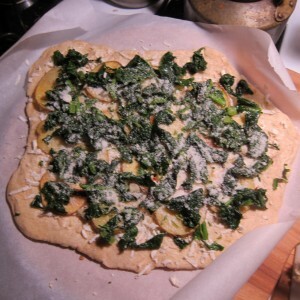 The potatoes almost melt into the crust, and the bitterness of the broccoli rabe is offset by the mellowness of the other ingredients. It was really a lovely combination. Now that November is nearly upon us, and there is definitely a chill in the air, it’s especially nice to have an excuse to turn the oven on high for a little while. And even better, there is pizza to warm you up at the end of it. Looks delicious! Do you have any suggestions (other than salad toppings) for what to do with the winter radishes? 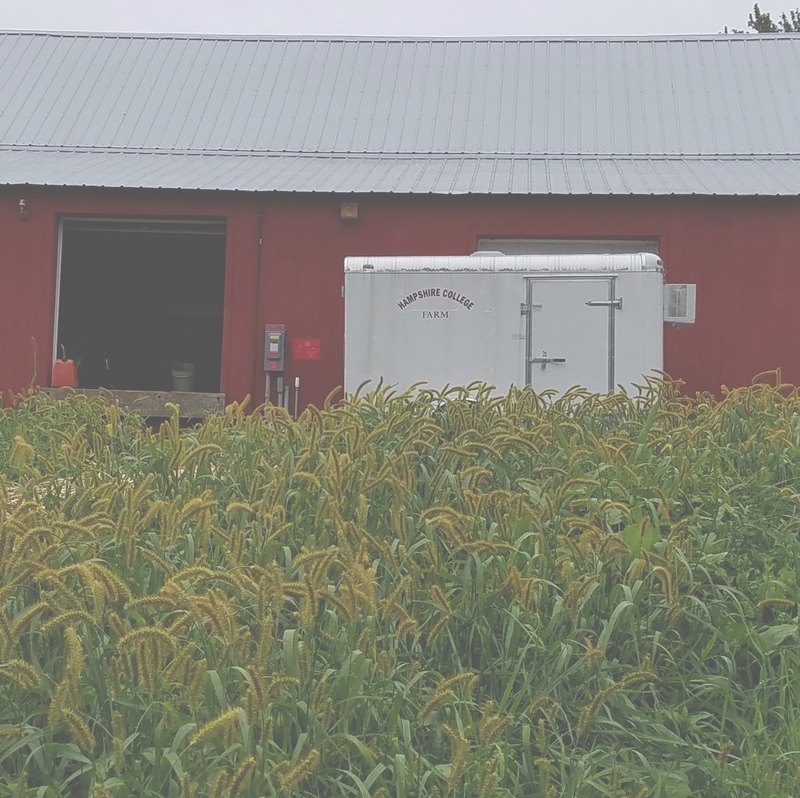 I did a little radish research for you! One option is roasting the radishes (as such: http://projects.washingtonpost.com/recipes/2012/01/11/roasted-radishes/) You could also cook them briefly in a stir-fry. 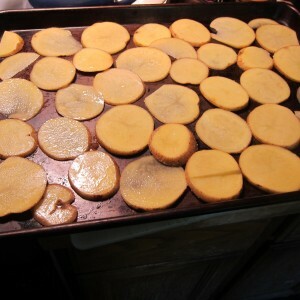 (The color fades if you cook them too long, though.) 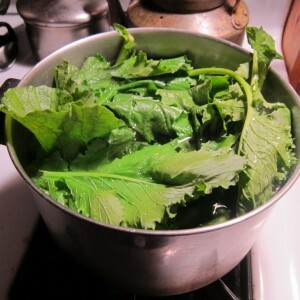 I also found recipes for a nice looking radish salad with sesame oil (http://www.culinate.com/recipes/collections/Contributors/emily_horton/winter_radish_salad) and for pickled radishes (http://www.nextstepproduce.com/recipes/pickleddaikonradish.php). I hope that helps expand your radish horizons!